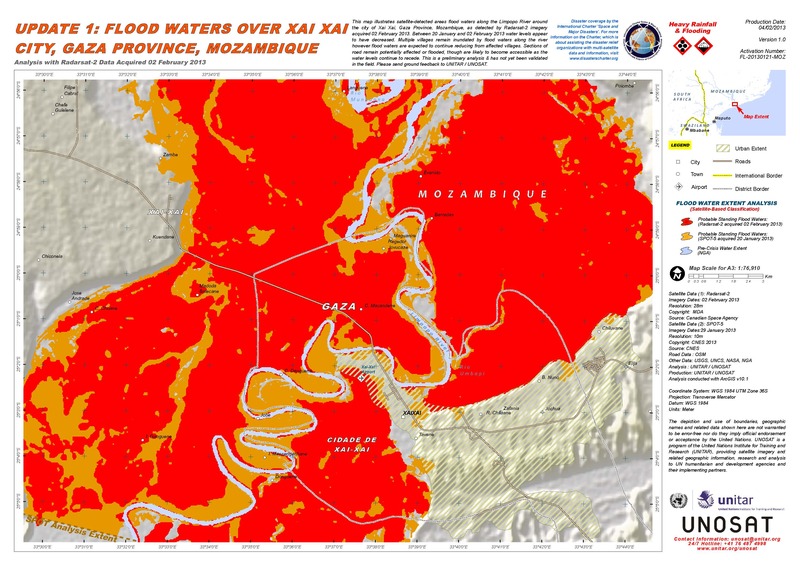 This map illustrates satellite-detected areas flood waters along the Limpopo River around the city of Xai Xai, Gaza Province, Mozambique, as detected by Radarsat-2 imagery acquired 02 February 2013. Between 20 January and 02 February 2013 water levels appear to have decreased. Multiple villages remain inundated by flood waters along the river however flood waters are expected to continue reducing from affected villages. Sections of road remain potentially affected or flooded, though are likely to become accessible as the water levels continue to recede. This is a preliminary analysis & has not yet been validated in the field. Please send ground feedback to UNITAR / UNOSAT.